By Andrew Kaushik (Rostov-on-Don) and Vladimir Dergachov. All photographs are by Andrew Kaushik. 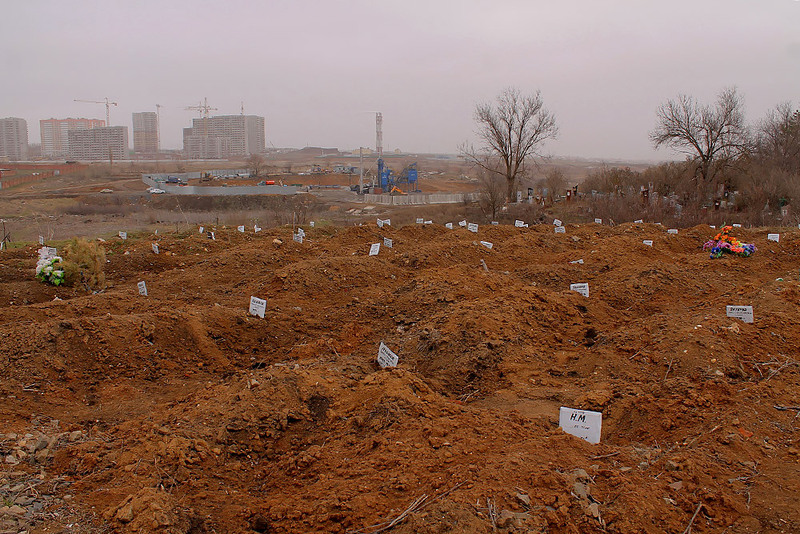 Photographs of fresh graves in Rostov-on-Don cemeteries, where Russian volunteer soldiers killed in Donbas were allegedly buried, have been circulating the Internet and were published in the major Ukrainian media. 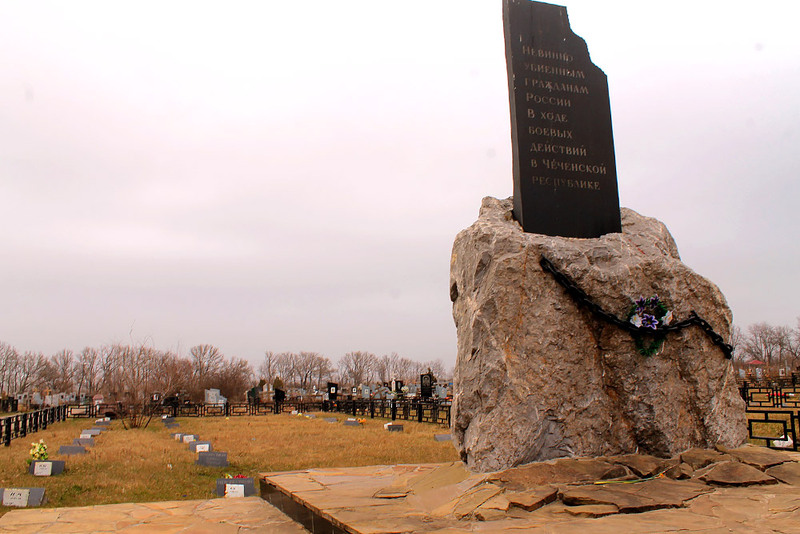 Gazeta.ru’s correspondent went to the Rostov cemetery and investigated the situation on site. 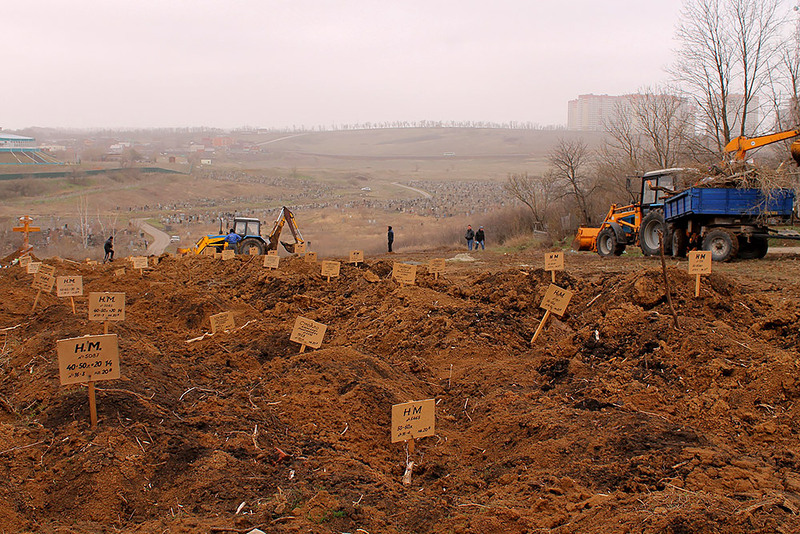 There were rumors of secret burials even three years ago: some civil activists thought that the authorities underreported the number of casualties from the floods in Krymske by several times. Referring to the anonymous statements by “emergency service workers,” they insisted that over a thousand people died, not 171. 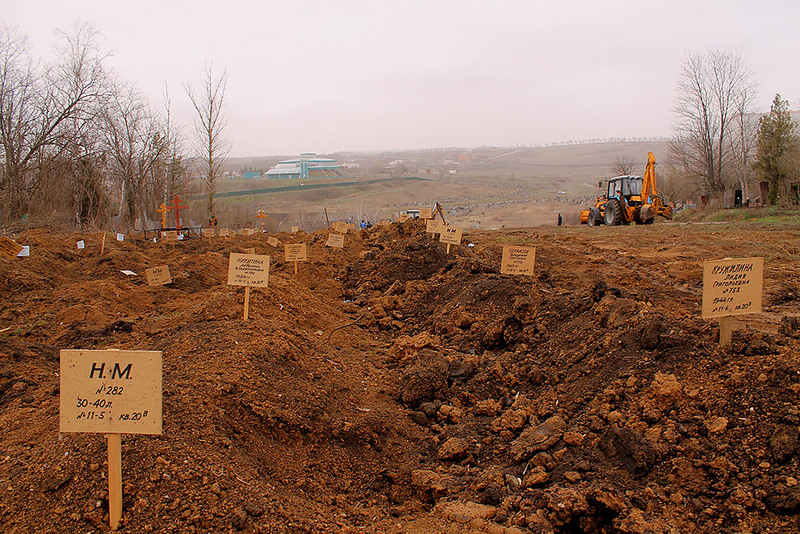 They looked for their graves in the adjacent Slovyansk district, but no evidence was submitted. It seems that it is possible to hide anything in the North Cemetery in Rostov-on-Don, one of the biggest [cemeteries] in Europe, even a battalion or a division. 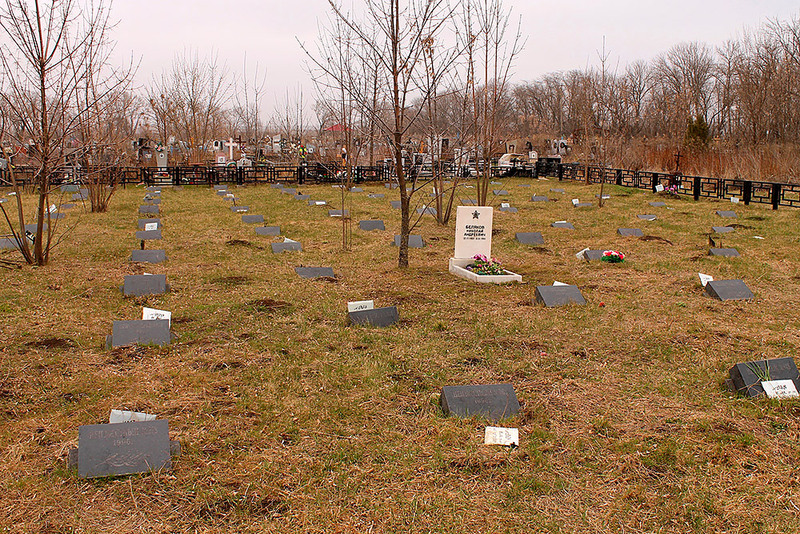 The head of the administrative department for city cemetery services, Valeri Zykov, says that the area of the churchyard is more than 400 hectares. Half a million people have been laid to rest here over 40 years. This is the only active cemetery out of eight city cemeteries; the others are only used for very close relatives. We don’t have this here, to bring them and secretly dump and bury them. I could have gone to prison for this for a long time. I will never agree to bury insurgents or anyone who has not been authorized. Some white stones have the name and dates, others have a featureless “UM” (unknown male) and “UF” (unknown female), with an approximate date of death and age (“40-45 years,” “60-70 years,” “40-50 years”). There is a large range, from 30 to 80 years. He admits that he has found some photographers here, but they are “just sick,” and when he goes to talk [to them], they run away for some reason. In another lot, “20b,” the excavators are still buzzing in the trench as workmen stand to one side smoking. Some “unidentified” graves are fenced off, and are even marked with simple wooden crosses. Relatives are found according to last names, they pay their last respects, even if they are late. One separate part of the cemetery is a memorial to unknown soldiers killed in the first Chechen campaign. Several hundred separate graves with small headstones, like in American films. “Then there was a war where the government participated officially. Today we are saying that the army is not fighting, but we do admit that there are volunteers and ‘tourists/ vacationers.’ In my understanding it is uncivilized,” says the head of the historical memorial of the Rostov section of the Russian Society for the Protection of Historical and Cultural Monuments, Aleksandr Kozhin. According to Kozhin, if Rostov volunteers are dying in Donbas, their comrades would not commit them to the earth in secret, but with honor. He explained that the Don [area along the river Don] search staff went to Donbas several times. During one of their trips, the insurgents themselves detained another young man. They took him for a Ukrainian spy and almost put him up against the wall. After some other insurgents from the self-proclaimed republics “apologized profusely,” they let him go. Even the independent organization, “Women of the Don,” who deal with enlisted soldiers and monitor the situation with Donbas, do not know about the mass secret burials of insurgents who have fought in eastern Ukraine. The head of the organization, Valentina Cherevatenko, told Gazeta.ru that she had no information about the “suspicious” graves. The official confirmed that they regularly bury unclaimed bodies. If relatives are not found and the surname is not known, the headstones just show an approximate age and the letters UM or UF. It has always been like that, ever since the North cemetery was opened in 1972. According to him, the morgues themselves carry out tenders and identify a funeral organization. In one year, 436 people whose identity was not established were interred in a city with one million inhabitants. The bodies are periodically removed once they accumulate. The news about the arrival of 500 new graves was like a case of “Chinese whispers.” According to Artsibashev, in 2014 the authorities planned a road through the new Suvorovskiy city district (you can see it behind lot 31a), which went round the edge of the North cemetery. They needed 500 exhumations to do this. They abandoned the project after consulting the law in detail: it is not permitted to build anything on the cemetery, only plant trees. The field commander of the self-proclaimed DNR, Oleg Melnikov, told Gazeta.ru that Russians who are killed are buried locally if their relatives could not be found, or under extreme circumstances. For example, [like it happened] last summer when Slovyansk was surrounded by the ATO forces. “Then it was not possible to move the people out, we buried them in a cemetery under the names of their commanders. On my people’s graves, there was the letter ‘M,’ I knew where my men were to ensure their graves wouldn’t get dug up,” Melnikov says. They take the bodies out of the morgue and transfer them over the Russian border only if they find relatives to whom they can give the deceased for burial, the commander confirms. Other insurgents that Gazeta.ru has talked to said that they themselves move their comrades’ bodies out and give them to relatives. Vladislav Brig, the head of the self-proclaimed DNR Ministry of Defense said that the Donetsk Ombudsman negotiates with relatives and controls the dispatch of the bodies of Russian volunteers to their relatives. According to him, the bodies are periodically removed once they accumulate. This entry was posted in English, English News, Others, South&Eastern Ukraine, War in Donbas and tagged #FreeKolchenko, #FreeSavchenko, #freesentsov, #RussiaInvadedUkraine, #StopRussianAggression, #UkraineUnderAttack, Ukraine. Bookmark the permalink.